Directions: The village of Kleinberg is located in the city of Vaughan and reached by Highway 27 which connects to the major highways in the Greater Toronto Area. Bindertwine Park is located off of Stegman’s Mill Road, just west of town. Kleinberg, Ontario is home to the McMichael Canadian Art Collection, a showcase for works by the Group of Seven and other Canadian artists. 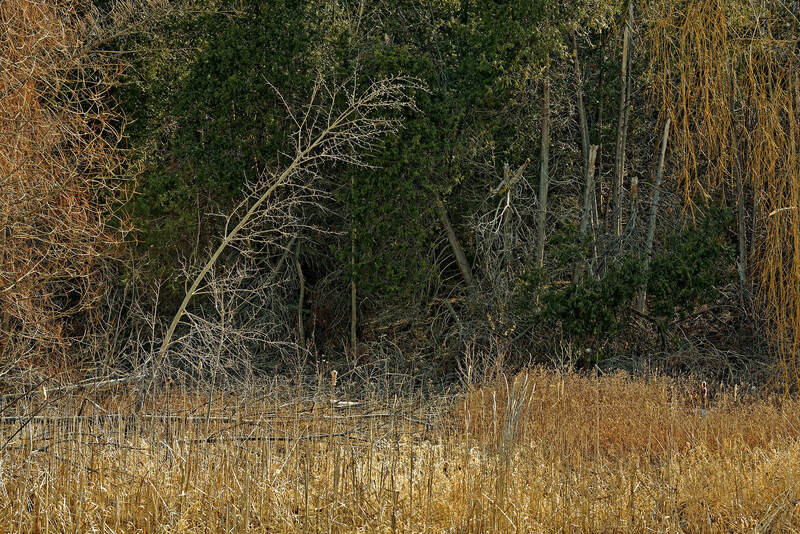 It is also adjacent to considerable watershed land for the tributaries of the Humber River. Part of this land is formerly set aside as “Bindertwine Park”, but woods abound along all of the creeks in the area. 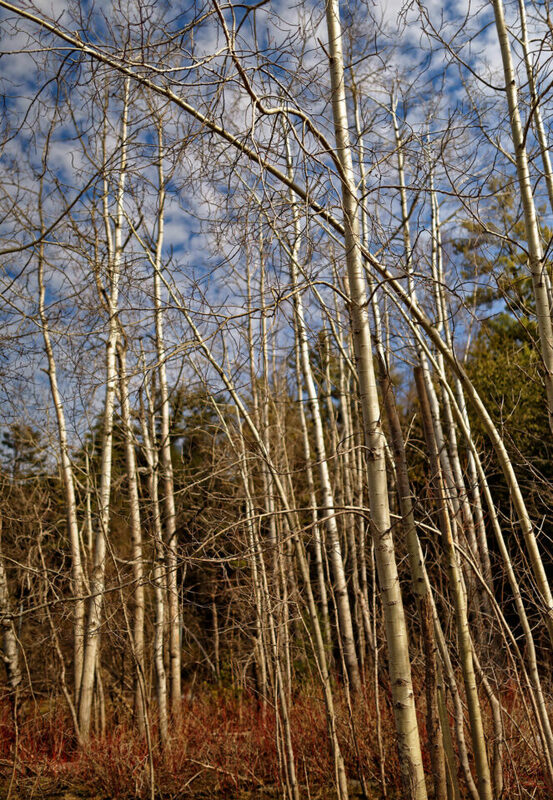 Framing the cleared and playground areas of the park are collections of white birch, as seen in the featured image. 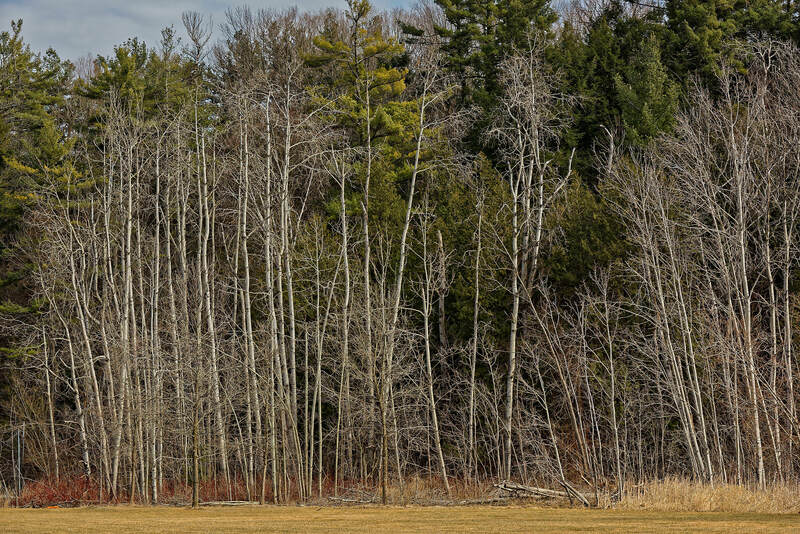 These shots were taken in early spring, when the woods were in recovery from the long winter. There is so much detail to capture in the woods that balancing a desirable aperture setting of say f/8 with a desirable low ISO setting of say 200 or 250, means flirting with shutter speeds that will betray any instability in the camera for the shot. A zoom lens with high resolving power, good rendering characteristics, and steady vibration reduction allows you to go freely where a tripod could pose an issue, as in the next photo. 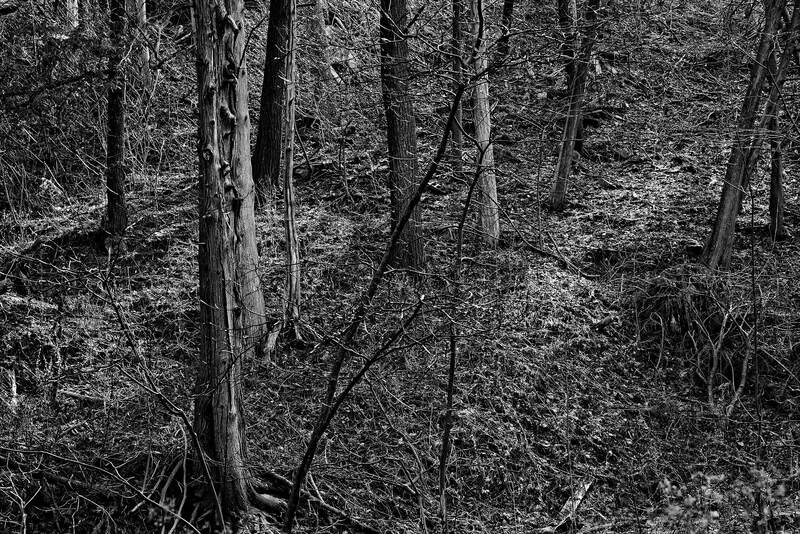 The early spring conditions meant there was barely any colour in this shot before it was converted to black & white. For a different mood, a fast prime will provide separation of a focused subject and softening of a background – the graceful white birch reaching up to cotton-ball clouds in the sky seemed a fitting use for the wide open prime lens used in the next photo. But the level of detail in the final shot comes together with the lens set for optimum sharpness, camera to lowest ISO, and a vibration reduction assisted shutter speed.